For months, Chris and I have been looking forward to today. Not just because it's Hannah's 18 month birthday. But it's what many adoptive parents call the "magic birthday." Magic because today is the day when Hannah has been with us longer than she wasn't. She spent a day shy of 9 months in China, bouncing between the orphanage and foster care (and who knows how many foster families). And she has spent 9 months and a day with us. Her family. I can't believe it. It's a very strange feeling. At the same time it feels like she has always been a part of our lives and that it was just yesterday we were in China. I am constantly amazed at how far she has come. She was so teeny tiny when we got her - I remember freaking out a little bit the first time I dressed her at how big the 6-9 month onesies and pants were on her. And she couldn't sit up on her own or feed herself. She was happy to be with us - relieved, almost - but still unsure. Today? 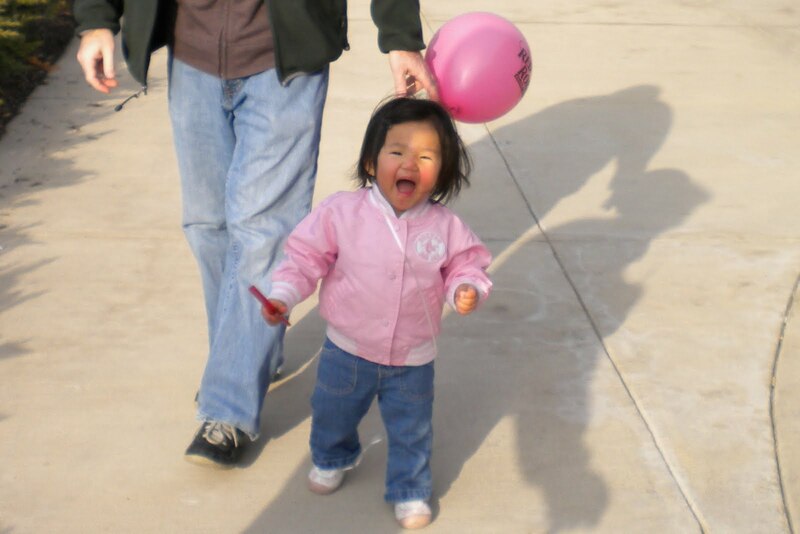 Today she is a funny funny kid. She is full of personality - she loves to tease us, laugh, joke, tickle, "sneak up" on us, play hide-and-seek and tag, and laugh some more. She's much bigger now - her 18 month clothes fit her perfectly (if not starting to get a little small...one thing that has not changed is that she LOVES to eat). Make a statement with custom holiday cards at Shutterfly. Happy Hanukkah! We have had a wonderful time celebrating Hannah's first Hanukkah. She started slow...the first few nights she liked helping us light the candles but was very upset that she wasn't allowed to touch the lit candles. By the weekend she was still annoyed, but starting to accept, and last night she didn't even ask. :) She also has her own stuffed menorah that she puts a new little stuffed candle in every night that she really likes. It was also great to be able to light candles with Bubbe and Zaide for three of the nights and celebrating with friends over the weekend. Opening presents did not get off to a slow start. Hannah LOVES to tear the off the wrapping paper (handing it to us in teeny tiny pieces) - she unwrapped everyone's presents this year. She probably likes opening presents more than the presents themselves - it's supposed to be horribly cold next week, so perhaps one of our activities will be wrapping and opening all of her books. Presents aren't the focus of the holiday, but she is pretty pleased with all of her new books and stuffed animals. She especially loves the Fisher Price Barnyard from Bubbe & Zaide and Barkers the Dog from Grandmother and Grandfather. 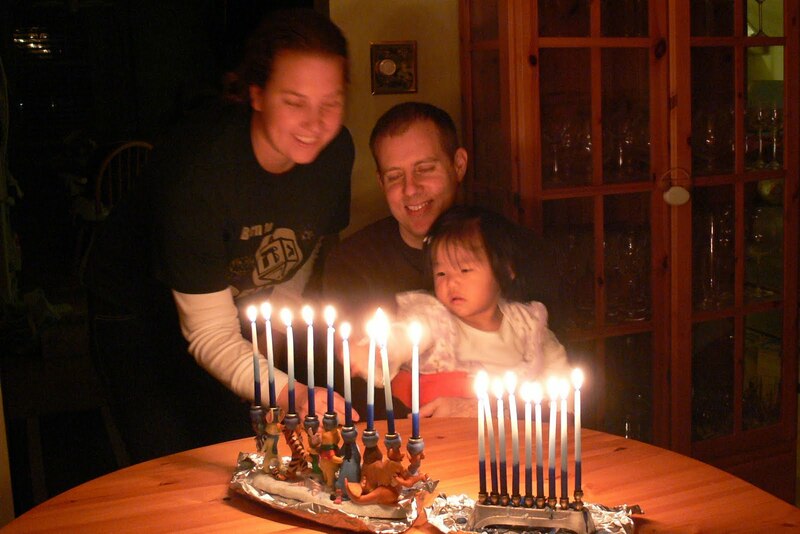 The other Hanukkah traditions have been fun to share with Hannah too. Bubbe made latkes on Thursday, and our friend Marcie made them on Saturday - Hannah is not a huge fan (though Mommy was more than happy to eat Hannah's!) - we think that they are too greasy for her. (if it were up to her, she would eat cheese and fruit at every meal!) And Hannah's favorite part is playing dreidel. She laughs every time we spin one for her - she now has four, including one from Israel. It's so funny to watch her try to spin her dreidel herself - she can't quite figure out why they don't spin when she throws them on the floor.